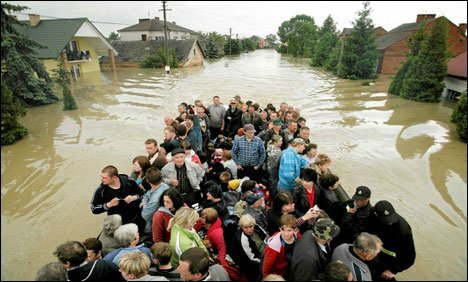 Deadly flood waters continue to rise across central Europe and thousands of people have alredy fled their homes in the region. Emergency operations are under way in Austria, Germany and the Czech Republic to cope with river levels which have reached record heights in some places. Landslides and flooding have led to the deaths of at least seven people. More than eight others are missing. The German army has been drafted in to help reinforce flood defenses in the south and east of the country. In the Czech Republic, a nationwide state of emergency is in force. Around 3,000 people have been forced to leave their homes across the west of the country. The authorities in the capital, Prague, are on high alert amid fears that the River Vltava could swamp its historic centre. On Monday morning, the river was flowing at 2,800 cubic metres per second – 10 times its normal volume. As a precaution the city’s metro system has been closed, metal flood defenses are being erected and sandbags built up along the banks of the Vltava. No major evacuations are planned in Prague, but tigers at the city’s zoo have been tranquilized and moved out of an enclosure thought to be at risk of flooding. “The story is not yet over here,” warned Environment Minister Tomas Chalupa. Although the Vltava was expected to rise again on Tuesday morning, officials said it was unlikely to reach the levels seen in 2002, the last time Europe saw similar floods. Seventeen people were killed in the Czech Republic and the cost of the damage across the continent was estimated at 20 billion euros ($26 billion). The destruction so far seen in the capital has been relatively minor compared to elsewhere. In southern and western areas of the country, several towns and villages are under water. Main roads in many areas of central Europe have been closed and rail services cut. Thousands of homes are without power. Czech police said on Monday that at least five people were now known to have died due to the flooding. Two people died after their cottage collapsed on Sunday, and three people had died in separate incidents across Bohemia. Several people are missing.